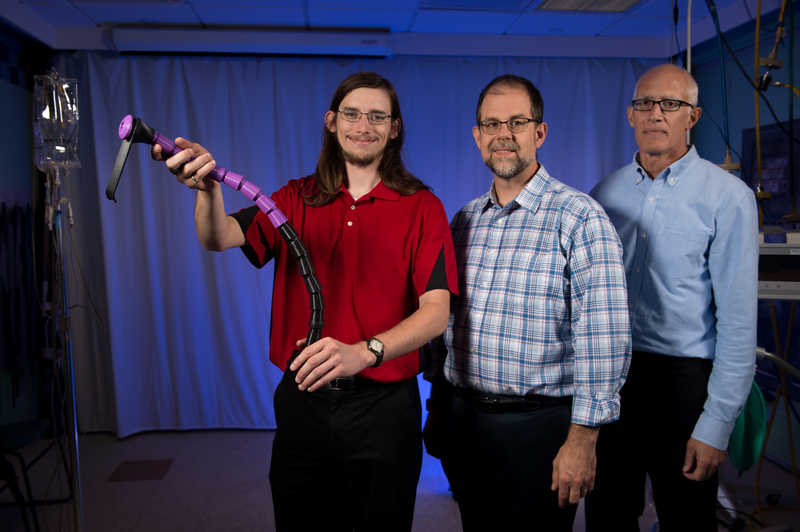 PhD student Christopher Dumm, left holding the prototype retraction device for Atlas Medtech, Professor of Mechanical Engineering and Bioengineering Jeffrey Vipperman, and Joe Marcanio, CEO of Atlas MedTech. From the spark of an idea to a licensed startup company, the launch of Atlas MedTech took less than three years, fueled by nearly $300,000 in commercialization gap funding and close mentoring from an Innovation Institute entrepreneur in residence. It all started in 2015 with an observation by Pete Allen, a Pitt bioengineering graduate who had just begun his medical residency at UPMC Mercy Hospital. Observing an abdominal surgery, he timed the set-up at nearly 20 minutes. There has to be a better way, the engineer in him thought, as the patient lay waiting on the table under anesthesia as medical staff toiled to erect the bulky retraction device. After many helpful discussions with co-inventor Dr. Garth Elias, Clinical Associate Professor of Surgery at UPMC, he brought his observations to Alan Hirschman, Executive Director of the Pitt Center for Medical Innovation – which provides seed funding to teams of physicians and engineers seeking solutions to medical problems. Hirschman introduced him to Jeffrey Vipperman, professor of Mechanical Engineering and Bioengineering, a veteran of biomedical product development, who jumped into the project with both feet. 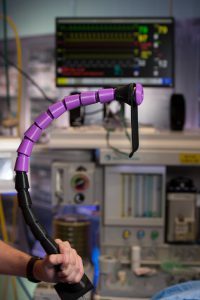 So began a remarkably rapid journey from Allen’s initial identification of the problem to this June, when a company formed to bring a new medical device to market executed a license with the Pitt Innovation Institute to take the technology out of the University and work towards bringing it to market. The speed with which the idea moved from concept to company can be attributed to the monetary, technical, and educational resources that coalesced to identify and quantify the market opportunity while iterating on prototypes. The last piece that came into place was mentoring from Innovation Institute entrepreneur in residence Joe Marcanio, who initially had guided Vipperman and PhD student Chris Dumm through a rigorous customer discovery process where their concept for an adjustable retraction arm that the surgeon can make rapid adjustments with ease was vetted by dozens of UPMC surgeons. “It is easier to start a business when there is ‘pull’ from the potential customer,” Marcanio said. An initial round for funding from the Center for Medical Innovation enabled prototype development. “Projects like this don’t happen without the kind of seed funding groups like CMI provide,” said Vipperman. “Pete (Dr. Allen) came to us with a lot of ideas about creating an articulating arm with a motor box that could be controlled with a foot pedal,” said he further explained. “We got a good head start. It sounded like a straightforward project at first, but achieving the required rigidity in a small, user-friendly package turned out to be a significant technical challenge. As Vipperman and Dumm continued to work on the prototype engineering, the team was accepted into the Coulter Translational Research Partners II program with Dr. Kurt Stahlfeld, Director of Residency at UPMC Mercy Hospital, serving as the principal investigator for the clinical portion of the study. With $100,000 in funding, Marcanio said Coulter enabled the “killer experiment,” entrepreneurial slang for an experiment that will either prove the innovation viable or kill the project. In this case, it means building devices of sufficient quality for clinical use to prove their value in up to twenty surgical procedures. “For a medical device to be accepted, the surgeons have to love it and actively want to use it: it must help the surgeon. But for a device to be adopted, the administrators need to see improved patient outcomes and/or improved economics,” Marcanio said. The AtlasMedTech retraction device allows the surgeon to position the device during surgery and lock into place with the touch of a button. Even as he proceeds with Atlas’ initial product, for which he and Vipperman are currently finalizing the technical design, conducting sterilization testing, and lining up materials suppliers and contract manufacturing, Marcanio is keeping an eye toward the future. He is contemplating product variants, including one to hold a laparoscopic camera. He also envisions entirely new applications. In the customer interviews, one orthopedic surgeon asked if the tool could be modified to hold entire limbs. Other uses could go beyond the medical space into more industrial applications. Translation of technical know-how into viable products is commonly referred to as no man’s land because it is fraught with risk and therefore challenging to finance. 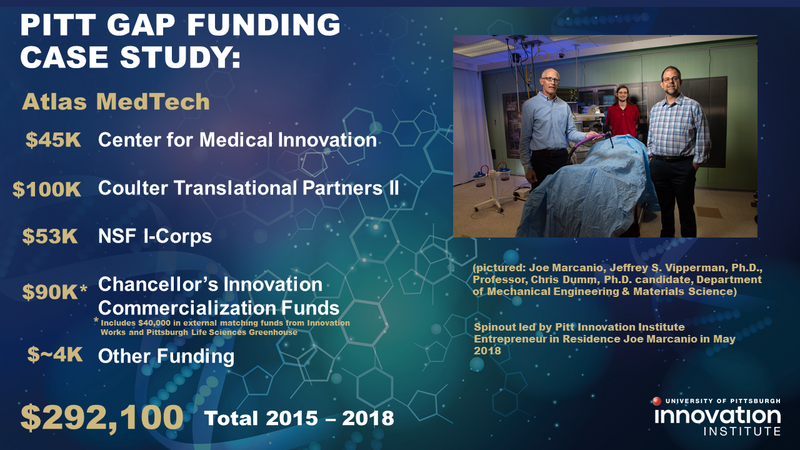 Funding available at Pitt through multiple sources by pitch competition not only makes projects like this possible, but also provides a selection process to fund the projects most likely to succeed.